With the increase in curiosity on what the 'Upcycle workshop' will be? Not many are aware of this term called upcycle, in fact when you wan to type it in text or message it does not appear in auto correction dictionary too. So we thought of sharing a beautiful article on Upcycling , highlighting the difference between Recycle and Upcycle. 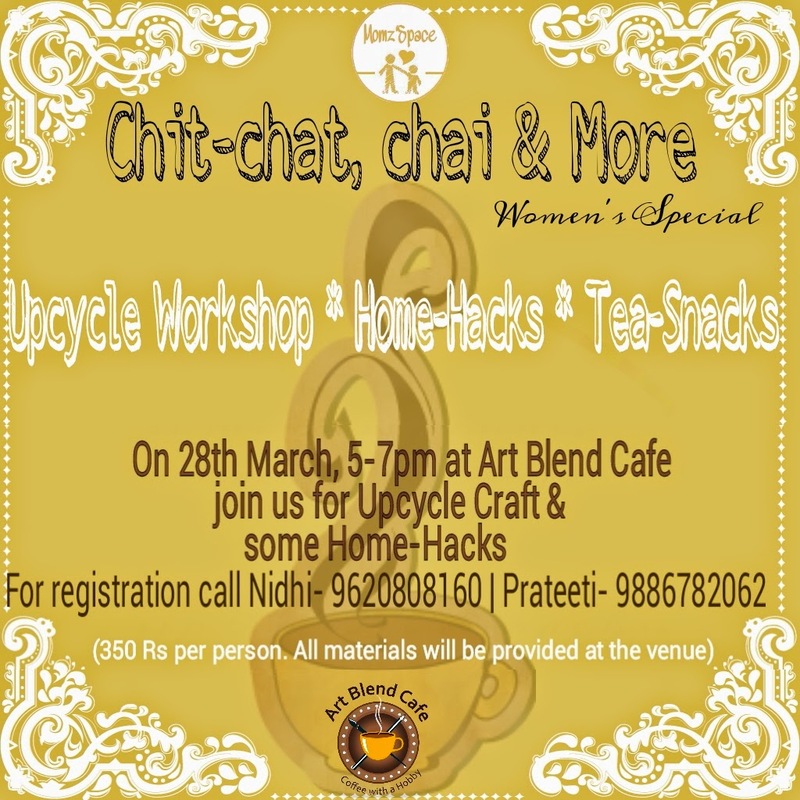 Ladies who are attending the 'Chit-chat, Chai and more', please read the below linked article and get geared up for the upcycle workshop. Upcycle is also known as 'Re-purposed'. The event, the 'Chit-chat, Chai and more' is hosted by Momz'Space in association with ArtBlendCafe. We take immense pleasure to announce that our upcoming event, "Women's Special> Chit-chat, chai and more', is supported by urday, Vidya Ramurthy, founder of passion driven initiative Satthvam. We are glad to be associated with and supported by passion driven Eco-freindly start-up 'Satthvam'. Vidya will also share few home-hacks and tips and trick for upcycling the trash products. Over the last decade the term “Upcycling” has been coined and worked into the discourse of sustainability efforts. It appeared in William McDonough’s book, Cradle to Cradle. It has yet to earn itself mainstream popularity, but its necessity as a goal for how we should be progressing makes its definition important. Like so many things in sustainability, I come across many enthusiasts who are trying to promote the practice but may be passing around an incorrect meaning. We all know what the basis of Recycling is: a practice that takes an item and targets it for reuse, returning it back to the cycle of daily contribution to society rather than discarding it to trash. Kids below 3 yrs comes Free, also kids craft activities will be available at the venue. Kids above 3 yrs are charged 200 Rs. including food and craft activities. We began the month of March with an amazing celebration of "Women's World" on 8th March i.e International Women's Day 2015. All the women participants celebrated women's day in an unique manner, from connecting with like-minded women , learning new art to listening to soulful composition by women guitarist/voacalist Preeti Khattri. We bunch of creative souls and enthu women, made new friends and cherished old ones too. So we all planned to have one more get-together before we end this month of March. Also inviting all the women who missed out the 'Women's Day' celebration'. Most of you lovely moms would be keeping up with the exam fever for final academics. My recent post on mybabycart Baby Blog is all about how to not pressurise and strategise study or learnign structure for little one. My opinion is very straight and simple, 'Let the Little be', let summer camps be at the bay. My views are not against any summer camp practice but at toddlers age it's too early. Having recieve couple of mails and enquiry to recommend summer camps in Bangalore ans mumbai, I had to pen this article on MBC babyblog. I would also recommend the young parents to spend as much as time in holidays with your child. As this is the only opportunity you get to learn new things of your child, and will help you to make befriends with them. During summers, my mom use to host sports day for kids and also fancy dress. No sponsors , no stalls, no fancy gifts. After the sports day and fancy Dress competition she you distribute small gifts to all and also give home-made cream with Jelly :-) This would sound quite usual for us urban / modern moms now, but since then this was as equivalent as McDonalds treat. We enjoyed small home-made ice-gola, park visits, play date to IFFCO and bhel-paani poori party at our terrace. My mom not only used to organised these playdates but also participate with us in all activities we did. Now, looking at the mangoes hangingin courtyard trees, beaming sun and other activities I do with Erishka and her friends. I just could nto resist to relive those childhood summer holidays. With the e-mails from my mommy readers flooding in my inbox, asking me queries for what is the right age to send kids for abacus, which are the language development classes for kids at 2-3yr, foreign language or coaching for the preparing to get admission in desired branded pre-school. Time changes, but small yet simple things still makes us happy. So lets, relive our childhood by being playful and involved with our kids activity this summer. So be active, creatie and plan some cool and awesome playdates for your kids. Am sure they will remmeber this golden period, like we are cherishing our childhood summer. I miss how I use begin and end my day with mangoes and mangoes, love for mangoes never die. I miss helping my mom making potato chips ( I used to love the pre-fried boiled chips), also 'Achaar', loved to slipped few marrinated mangoes slices in salt and spices , and chew it till my teeth titter tatter... and doing lots of crafts, playing games with my sister and my mom.... Miss you summer , miss the time spent and miss you mumma. Heylos to all lovely ladies, after recovering from acute viral fever followed by all family members too, somehow I gathered myself, put on party shoes and celebrated the 'International Women's Day' in a Soulful manner named, 'Women's World'. With we all three moms ( Prateeti, Archana and me) in business running around for not only organising event but also for our kids who were struck by virals..
On 8th March 2015, Momz'Space hosted 'Women's World' at Art Blend Cafe in a unique manner. Unlike any other women get-together, this celebration was one of it's kind. No! it was not a kitty party, not a tea-party, no stall-exhibition, no cliche' exchange of Business Cards or any sales pitch. It was one in all a soulful experience with lots of art, learning and positivity to celebrate womanhood. We had organised two art session one was 'Jewellery Making Workshop', and the other was nail-art, followed by 'Positive Talk' by Pragya Prasad (Tarot Reader) and soulful composition by Singer-composer Preeti Khattri. The participants of this event were artsy yet musical too. They enjoyed learning session of Jewellery making and too home a pair of lovely handmade earring each and a sparkling smile. Woman who were donning mom's hat, came along with their kids tagging, and Shipra Aunty taught them some creative and colourful crafts too. After being creatively inclined, we did had an amazing 'Positive Talk' by Pragya. All the ladies on the deck just loved listening to her as each of us could relate to what she was talking, yet also giving positive aspect for the same. There arrives our soul of the evening, Preeti Khattri - Guitarist, vocalist and composer. Preeti walked in, with beaming smile and a sparkle in her eyes. Lady guitarist just rocked the evening with a soothing blend of Bollywood music and western numbers, Each one at the deck was foot-tapping and swaying along with her tunes. So much thanks to Prateeti for allocating perfect spaces for each activity, it was organised, non-mess artsy event. Super thanks to the Art Blend Cafe's staff who patiently tackled 22 talkative/impatient/demanding ladies, Lens Dynamic - Photographs by Tushar Shukla for official lens and also taking our mobile pix ;-) , Seema Mishra my sos :-) , Shipra Aunty and Special guest Woman Guitarist - Preeti khattri who made the evening eventful with soulful music to ears. We take immense pleasure to thank our support system powered by Women Entrepreneurs like Sujata S Iyer(Founder of Mommy and Me With Su, Vocalist, voice-over artist) , Hema Latha (Owner of Fashion Boutique -'The Fine Colors, & Co-Founder a women driven Taxi Service, 'Taxshe') and Priya Mankotia (Chocolatier & Founder of Krisp and Crumbls). With their umpteen love, effortless passion and support from our proud women entrepreneurs, I am sure that all women participants had a wonderful evening, made new friends with like-minded women, and loads of memories from 'Women's Day' to cherish for years to come.